Four years after her birth as a new kind of house servant, let’s blow out the candles, take a deep breath, and talk about the future of speaking. I believe that us humans and how we speak is going to fundamentally change with the rise of voice assistants. 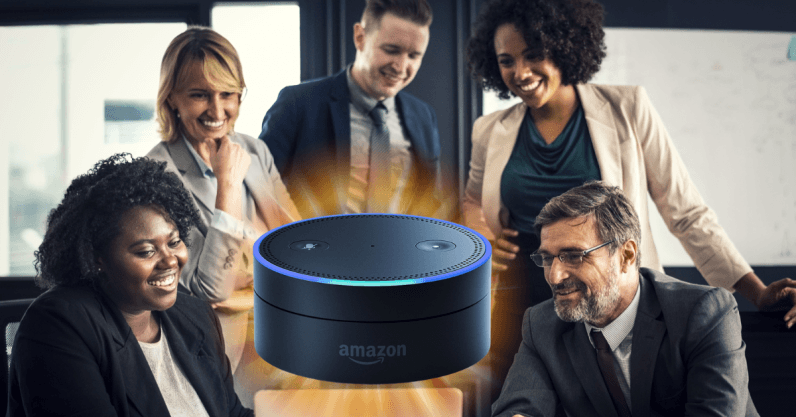 Many of the things we tap to control — keyboards, touchscreens, remote controls, fridges, even vibrators apparently — are already turning to voice control technology. And as they all do, we should be prepared for a new kind of speaking culture with a faster speed that changes office norms, favors a different kind of brain, and starts creating a bamboozlingly rich range of conversational styles. If this mad prediction turns out to be true, then culture is going to change faster than we think, and in unpredictable ways. So here I am, trying to predict them. Good luck! Technology, on a good day, helps us find faster ways to do things, be it get across town to a dinner party, or find cat pics faster if the other guests are boring. Well here’s something to think about when you think about voice control technology: it’s faster to speak than to type, and it’s faster to read than to listen. So when you put together voice control and these two facts, scrumple them up and lob them into our daily lives, what do we think is going to happen to us? We have a weird dynamic for the next generation of social interaction; people wandering around thinking it’s absolutely normal and convenient to speak out-loud and have those words captured by listening devices… not for other people to listen to, but for other people to read. Cos it’s faster. Your spoken words will be turned into text, or images, for others to read. The average lunch-time of the office worker is 28 minutes. We are all under the cosh to do basic things faster. So it would make sense, from an efficiency standpoint, for us to shout emails into our laptops (before the laptops disappear completely from the scene). The open office will become a blabber-pit before it changes to something a little bit like what went before. In the old days, cigarette-smoking bosses would call in secretaries into their individual offices and dictate their letters that they would compose off the top of their heads, waving a brandy around. The modern-day equivalent would be each of us in a sound-proof cell, taking to the air. So basically you’re going to look like one of the neighbors in Hannibal Lecter’s asylum. I can’t wait. Give us a night in, five cans of beer and a YouTube comment thread, and we all want to throw our opinion around in the quickest way possible. So imagine what this means for the speed at which we will “formulate opinions” and throw them into the fire of online debate. It’s going to get steroidal. Hate is going to get so much more… hatey. Trump is going to become un-manageable, free now of the effort of typing on all those big buttons. You’re going to say things you regret. I’m not sure screaming “Delete post!” is going to work that well. And then, after a while, most of us will start policing our own spoken words with the same over-posed quality you see in Instagram feeds. We’re going to speak like characters in an Aaron Sorkin script, one hopes. Science time. According to research from John Hopkins University, writing and talking are now effectively independent systems operating within the brain. It didn’t start out that way, but give generation after generation of apes a typewriter and you don’t get Shakespeare, you get brain mutations. So those apes who enjoy using the thinking-while-speaking part of their brain stand to benefit from never really having to type a goddamn word ever again, and the rest of us better start getting used to it. Let’s call the winners, “The Chattering Classes.” And they will start looking after their own, mark my words; while classical education might stay the same for a while, exams for vocational training will quickly change from written to spoken. The extrovert will have the upper hand, and it’s only a jealous snob that thinks that all extroverts say a lot and accomplish little; the best of them spray ideas around that can whip a room of borderline introverts into a frenzy of productivity. Look at what happened to writing because of mobile, it went mental. Text shortcuts, emoticons, gifs, boomerangs, etc… they have found their way to add to the riot of how we converse, in various degrees of novelty. How many well-intentioned vowels have effectively been removed from the way we write? Rapping fast, speed garage style, will convert into a highly prized and salaried job, but why stop there. What if you can manage a set of financial figures just by using whistles as short-cuts. Why not, it works with sheepdogs. But the one that really gets to me, is the idea that we will all get used to being the boss-man of a range of voice activated servants. From a young age, we will think nothing of sounding like an aristocrat of old. And what happens when we turn that tone on each other? That’s going to go down well with Gran. So while some future-gazers are excited about “how Alexa will impact google search,” I ask you to step back and think how fun this glorious chaos is going to be about the time Alexa is hitting puberty; all of us trying all of these different modes of speaking, unsure of how they will overlap and influence each other. The new Chattering Classes will go at it like a bull in a very echoey china shop, and they will change language, thought systems, values. LTRS!